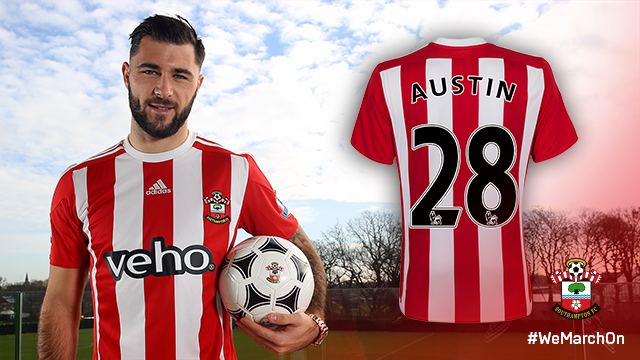 26 year old Charlie Austin has joined Saints on a 4½ year contract from Queens Park Rangers, for a reputed £4m. Given the rumours about his knee and the fact that he hasn't played since the middle of December because of a hamstring injury, it will come as some relief for Saints fans to hear that he passed his medical with no issues. Austin scored 18 Premier League goals for QPR last season, but could not help them avoid relegation to the Championship. Ronald Koeman was quoted on the BBC as saying, "He was our target for January. The number of goals he's scored in the Premier League is amazing." Although there have been rumours about various Saints forwards moving to other clubs, Koeman continued, "Nobody is for sale in January. At the end of the season, you don't know, but not now. We like to make the squad stronger. That means Charlie in, nobody out." Charlie Austin's contract at Loftus Road was due to expire in the summer, but has scored 10 goals in 16 appearances so far this season. It had been thought that austin would allow his contract to run down and move as a free-agent in the summer. Austin explained this, saying, "As soon as Southampton showed an interest that was the one club I wanted to go to."